Tourism, Culture & Sights in France. Say No to Animal Cruelty as "Entertainment"
The animal rights association PETA has published a list of the "entertainment" that is the cruellest to animals in Europe at http://www.peta.org.uk/feat/feat_europe_cruellest_destinations.asp?c=petaEurope_enews. If you care for animals, give this a thought. In 2012, the Futuroscope feature park got the incredibly bad idea to associate themselves with the Festival de Dax that features bullfighting as an integral part. How they consider bullfighting to be part of the future is beyond me. Better go elsewhere. Rendezvousenfrance.com - The new official tourist portal to France for foreigners, with a name that many foreigners can neither remember nor spell. Franceguide.com - Official tourist portal to France. This is to be migrated to rendezvousenfrance.com. See also General Travel Portals & Booking Sites. Government vacation guide 2011. A wealth of practical information about tourism in France. In French. Unfortunately, the administration that produced it didn't find it necessary to produce an English version. About France. A wealth of information about France. Rick Steves' Europe. Smart European travel. FNAC Spectacles. Tickets and bookings for events. Cometofrance, Tourist info about France. Planetware: Useful and concise fact sheets for tourist attractions. Culture.fr: Culture portal. In French. Ministry of Culture: Database of 160,000 monuments. Museum guide from l'Internaute. More than 300 museums listed. Monuments-nationaux.fr: Centre of National Monuments. List of French monuments. Based on interactive use of Google maps showing which monuments are situated at any given location. Ministry of Culture. Suggestion for tourist itineraries. Parcs naturels régionaux. Information about 44 regional natural parcs in France. Contemporary art guide and expositions. Allexperts France Travel Q&A. Volunteer travelers answer questions about tourism in France. Armchair France. Includes recommendations for places to visit, a list of books, music and videos, a small selection of recipes, monthly updates from Uzès, and details of sporting events. At Random in France. Reports and pictures about regions, traditions and products. Useful tips about accommodation, leisure and museums. Cyber France. Photos, maps and information useful for people travelling to France. First for France. Guide to France including regions, towns, places of interest, activities and events. Includes travel information. France - World Sites Atlas. A collection of general and tourist information, links, maps, and photos for Paris and 80 other places of interest in France. France for Freebooters. A collection of articles about France and its history. Travel writing and photography by Mike Kingdom-Hockings and friends. France for Visitors. Travel guide with information on specific locations, hotels and restaurants. France for Visitors. Offers a guide to French cities, monuments and countryside. Includes photo gallery and maps. France on Foot.com. Detailed information on equipment, maps, guidebooks, food and lodging. Plan a walking or hiking vacation on France's 110,000 mile system of trails and foot paths. France Voyage. Offering regional information about the landscape, culture, monuments, architecture, gastronomy and history. FranceMonthly. Information on places to visit on your next trip to France. Brochures available about various tours. FranceWay. A travel guide with sections on culture and heritage, regions of the country, dining and lodging; also has a bulletin board. French at a Touch. Information on places in France and links to francophone sites. GoSki France. French ski resort profiles, news, skier and snowboarder reviews, hotspots, activities, travel services, lodging, weather reports and snow conditions. Guideweb. Information on the regions of Ardeche and Provence in the south of France. iExplore France. Travel guide to France with information about places to visit. Midi Loisirs. Addresses of tourist and leisure facilities in the south of France. The Southern France Guide. 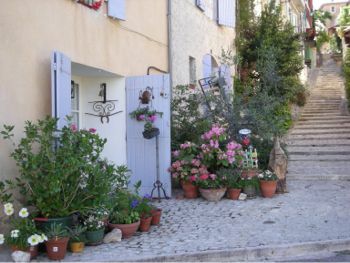 Commercial tourist guide for this part of France, with details of properties to rent. Terroirs of France. Guide to the regions of France and their culture and traditions. ViaFrance. Database of more than 3000 events including festivals, feasts, fair trade, celebrations and concerts. Western France Tourist Board. Tourism information covering Normandy, Brittany the Loire Valley, Western Loire and Cognac Country. CIA - The World Factbook: France. Features map and brief descriptions of the geography, people, government, economy, communications, transportation, military and transnational issues. France Pub. Portal to information, links and data about France and the French. France Time. Information on the country: news, weather, web-cams, events, features, tours, some basic French phrases. An index of French products and books on France sold online on other sites. France.com. Directory of recommended sites covering travel and tourism, business and shopping. Gourmet France. Web resources about French food, culinary travel to France, and gourmet recipes. US Department of State - France. Country portal offers a map and links to Background Notes, the US embassy and the current ambassador, press releases, fact sheets, annual Human Rights Reports and other major reports including Industry Market Reports. US Library of Congress - Portals to the World: France. Annotated directory of selected online resources. Tripadvisor.com. Travellers' advice about France and other countries. Simonseeks.com. Various articles about France and other countries. Wikipedia - France. Hyperlinked encyclopedia article covers the country's history, government and politics, geography, economy, demographics, language and culture. Cuisine-francaise.com. Index of French restaurants. Paris in Photos. Paris Photos, Life in Paris, Tourist info Paris. Blog. Parc Astérix. Asterix theme park Paris. Paris.org. Everything you need to know about visiting Paris. In English. Paris-eiffel-tower-news. Practical tourist info about Paris. In English. Magic Paris. Practical info. In English. Paris-France. Official Paris site edited by the Paris city hall. In French. Simplyparis. You may find some inspiration and practical information in English for a trip to Paris on this site. The visa information is severely incomplete, though. Things to do in Paris. Guide to Paris and its attractions in English, including travel and hotel advice. Pariswater. Paris by the water. Fountains, bridges, walks. In English. Citéfutée. Entertainment in the Paris region. Official site. Parissi. Entertainment info about Paris. In French. Parisavenue. Cultural and practical about Paris. In French. Cité des sciences. Parc de la Villette. Science exhibition. Opéra de Paris. Opéra National de Paris - Opéra Bastille - Palais Garnier. Cabaret Moulin Rouge. One of the famous Parisian cabarets. Cabaret Crazy Horse. Another famous Parisian cabaret. Cabaret Lido de Paris. Famous Parisian cabaret. Cabaret Folies Bergère. Yet another famous Parisian cabaret. Markets in Provence. Food, fish, flea, flower and other markets are an integral part of Provence and its culture that you would regret missing. This site tells you where they are and when. Decouverte-paca. Tourist info about Provence and the Riviera. In several languages. Cote.azur.fr. Practical info about the Riviera. In several languages. Provence beyond. Discover Provence. In English. Provenceweb. Everything you need to know about visiting Provence. In French and English. Web-Provence. Everything you need to know about visiting Provence. In French and English. Provence Ventoux: Le Blog. Modern Life and its Pleasures in the Vaucluse. By expat Bradbury Kuett. Lavender zones by Provenceweb. All you need to know about lavender. Arles: The Amphitheatre. Official site for the Roman Amphitheatre in Arles. Arles Antique. Official site for the antique Arles and its sights and Antique museum. Arles Antique: Hortus. NEW A new garden in Roman style is being created through 2008 next to the Arles Antique museum on a site of 7000 m2 or nearly 2 acres. It should be completed in October 2008. Official site. Touristic steam train Arles-Fontvieille. 40-minutes on a train from the 1950s. Pont du Gard. Large Roman aqueduct between Avignon and Nîmes. Official site. Pont du Gard. Large Roman aqueduct between Avignon and Nîmes. Intercommunal Defense Committee for the Pont du Gard Site. Pont du Gard. Large Roman aqueduct between Avignon and Nîmes. Unesco World Heritage site. Pont du Gard. Wikipedia online encyclopaedia. Grand Canyon de Verdon / Gorges de Verdon. Spectacular canyon. Good tourist map for itinerary planning. Nice-city-vacation. Insider's guide to Nice and the Riviera: Apartments, hotels, shopping, entertainment, general information on the Riviera. Avignon-et-provence. Tourist info about Provence and Avignon. In French and English. Avignon. Official site of Avignon. In French and English. History of the Malpasset dam near Fréjus that burst in 1959 from beyond.fr, in English. History of the Malpasset dam near Fréjus that burst in 1959 from ecolo.org, in French. History of the Malpasset dam near Fréjus that burst in 1959 from cholierphotos.fr, in French. History of the Malpasset dam near Fréjus that burst in 1959 from alsapresse.com, in French. History of the Malpasset dam near Fréjus that burst in 1959 from planet-terre.ens-lyon.fr, in French. Maison de la Truffe et du Vin du Lubéron. House of Truffle and Lubéron wine in Ménerbes. Walking-Languedoc. Site about trekking, hiking and walking in Languedoc and Provence. Grottes de Thouzon. Small stalactite cave that it is not worth the trouble visiting. There are spectacular caves in France, but this is not one of them. Ochre Mines in Bruoux. In the Luberon between Roussillon and Apt. Guided 650 metre (711 yards) tour lasting about an hour of an abandoned ochre mine with 40 km (25 miles) of galleries. The site shows when there are foreign language tours. Book in advance. Limited groups sizes. Karting Indoor Provence. Karting for adults and children. Mini motorbikes adults. Games, laser games, bar ... Aubagne, Bouches du Rhône, near Marseilles. Haribo Candy Museum and Shop. Uzès, Gard. There is a children's play area next to the museum. Marseille is a rising, formerly relatively unknown star. Vast efforts to rid the city of drug trade and mafia problems, including an urban renewal programme, have been largely successful. The high-speed TGV train connects Marseille with Paris in little more than 3 hours, taking you either to Paris centre or directly to the Paris Charles de Gaulle Airport at Roissy. Marseille Airport has good connections to European and North African destinations, and a new dedicated low-cost terminal, mp2, was inaugurated in 2006, making the low-cost carrier Ryanair open its French hub there. The climate in Marseille is mild, allowing you to walk outside in the sun in November in a t-shirt. A mountain chain protects the city from the Mistral wind from the north and provides for a pleasant and warm micro-climate close to what you can find in Nice. All year round, there is a notable difference between inland temperatures as close as Avignon and the warmer Marseille. Seafood lovers will appreciate the fresh fish coming in daily. Marseille is the origin of the famous fish soup bouillabaisse. Property prices are rising as a result of notably the TGV line to Paris, and buying in the Marseille area is likely to be a good investment. Within the city, metro and tram lines provide for smooth public transport. A motorway (freeway) tunnel under the old harbour and the city centre connects the northern and eastern motorway networks and allows you to drive straight into the city centre on the motorway. Driving in the city itself can be more challenging, as with other cities. There is a large beach and recreational area straight in the centre, bordering the Mediterranean Sea. Marseille has a large, modern port for cruise ships, ferries and container ships. Four des Navettes. Famous cookies from Marseille, prepared with orange flower from a secret recipe. Seen on the American Food Channel's programme Have Fork Will Travel with the comedian Zane Lamprey. Chez Fonfon. Fish restaurant in a charming setting in a small bay with fishing boats, the Vallon des Auffes. Expensive but excellent. Vast choice on the regularly renewed menu. Vast and excellent wine menu. Good and friendly service. This restaurant and its young chef Alex was seen on the American Food Channel's programme Have Fork Will Travel with the comedian Zane Lamprey. l'Epuisette. Fish restaurant in a charming setting in a small bay with fishing boats, the Vallon des Auffes. Expensive. Baux de Provence. Castle ruins with a spectacular view. Idyllic shopping village. avignon-et-provence.com. Baux de Provence. Wikipedia online encyclopaedia. Carrières de Lumières. Light show in a disused mine in Baux de Provence. New theme every year. The light show was formerly used by Cathédrale d'Images. Glanum. Roman archeological site. Wikipedia online encyclopaedia. Durand Chocolate. World famous artisanal chocolate producer. Taste his alphabet of chocolate. Restaurant l'Olivier, 21 boulevard Mirabeau, 13210 Saint Rémy De Provence, Tel: 04 90 92 10 19. Fresh and tasty produce, original and affordable menu, blending Asian spices and traditional French cuisine. Their wine menu presents the best of the local wines from the appellation contrôlee Baux de Provence, and at a very reasonable price. Friendly and informal service. I personally recommend this. The Baux de Provence has a small number of wine producers who benefit fro a favourable micro-climate. It gives some very good, full-bodied wines with an exceptional blend of taste. Wine Pages: Les Baux and Wine Pages: The Wines from Les Baux. ePyrenees. English travel and tourism guide site to the Pyrenees. Holiday accommodation. Oradour. Village in Haute-Vienne left as it was in 1944 when the Nazis murdered 642 men, women and children and destroyed the village. Guide to Brittany. Site in English with expat and travel information about Brittany. NAUSICAÄ, the French National Sea Experience Centre. Loiredeschateaux. The castles of the Loire valley. In English and French. Futuroscope. Theme park. In 2012, the Futuroscope theme park got the incredibly bad idea to associate themselves with the Festival de Dax that features bullfighting as an integral part. How they consider bullfighting to be part of the future is beyond me. Better go elsewhere. Regordane. Info site about the Regordane Trail or Chemin de Saint-Gilles in France. Cabaret Vieux Berquin. Cabaret in the North, between Lille and Dunkerque. Tel. +33-(0)3 28 42 75 75. Cabaret Folies de Paris. Cabaret in Lille in the North.